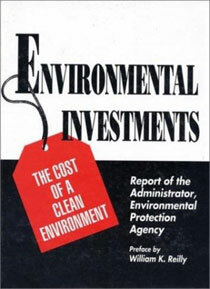 Environmental Investments is a report of the Administrator of the Environmental Protection Agency. An invaluable reference for businesses designing compliance plans, it tells industry what to expect in the way of direct, out-of-pocket expenses for implementing pollution control measures and undertaking compliance activities for environmental laws. It also projects costs of new and future environmental protection programs, and provides a detailed accounting of the $115 billion per year that the public and private sectors spend on pollution prevention and control.